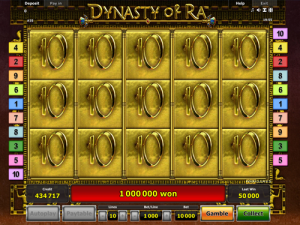 Dynasty of Ra is a video slot from Novomatic (Greentube) that worships the Ancient Egyptian God, Ra. The Ancient Egyptians worshipped Ra as the Sun God, as well as a Creator God. He was usually pictured as a man with a sun symbol sitting atop the man’s hawk head. As they still are today, cats were extremely popular animals among the ancient Egyptians. It was widely believed that Bastet was Ra’s daughter. She was also called the cat of Ra! In this Novomatic slot game, her beautiful cat-like features can be seen on the reels. She’s the most important character in this game, as she carries on the Dynasty of Ra! Dynasty of Ra is yet another Egyptian-esque slot from Novomatic. This theme is ever popular among slot players! This video slot has 5 reels and 10 paylines. The paylines aren’t adjustable and they are always active. The return to player percentage (RTP) of this slot is slightly above 95%. Most slots from Novomatic are around this same percentage but there are some which pay out more, such as: Diamonds of Fortune, Columbus, Simply Wild and Bugs n Bees. Dynasty of Ra is very similar to the Book of Ra slots. It has Free Games which also come with a comparable feature! The ancient Egyptians didn’t have playing cards to keep them amused but they’re a big part of casinos and gambling now! That’s why the high cards feature as symbols on these reels. These are accompanied by: a cat mask; a beaded necklace, an ancient instrument, a sphinx statue and the beautiful, feline Bastet. Bastet gives the biggest wins of all the symbols! She’s adorned in a glorious gold headdress and she’s wearing exquisite turquoise earrings. She and the other picture symbols have payouts for x2, x3, x4 and x5 consecutive matches. The playing card values, on the other hand, have payouts for only x3, x4 and x5 consecutive matches. Matches must fall from the left on one of the ten paylines to give the payout. Wins in Dynasty of Ra can be gambled, so long as the game is not on autoplay mode. When gambling a win, you’ll have a 50% chance of doubling it and a 50% chance of losing it. It’s all about red or black – so choose wisely! Autoplay is great if you want to play for a long while but don’t want to keep clicking. Just don’t forget that if you do want to gamble or change any settings, you’ll have to exit autoplay mode to do so. Novomatic shines through in every aspect of this game – especially in the extra features! There’s one more symbol on the reels and this is the Eye of Ra symbol. The Eye of Ra symbol is a substituting scatter. So, this slot doesn’t have Wilds but it has Scatters that have triple powers! The Scatter symbol can stand in for any one of the ‘ordinary’ symbols, including the picture symbols and the playing card symbols. 3, 4 or 5 Scatter symbols, landing on any positions on the reels, will give a payout and 10 Free Games. During the free games, there’s an active feature that’s almost identical to the one from Book of Ra, except this one is better! Like in Book of Ra, there are special expanding symbols which can fill entire reels to give you multiplied wins. In Book of Ra, however, the game only selects one symbol to have this power. Not in Dynasty of Ra. In Dynasty of Ra, every symbol has this special power! The Free Games aren’t triggered very often in this video slot but, when they are, the Free Games pay big time. Especially thanks to this generous feature! Hoo-Ra for that!